Such a good little huntress! Hang on babies and Bean. Tomorrow is payday again. 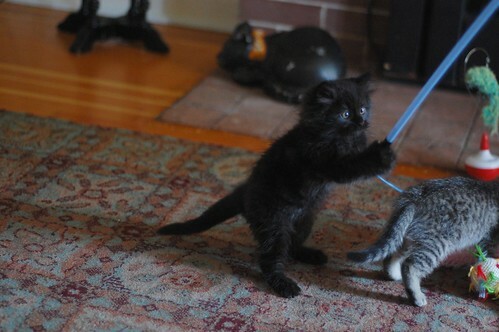 Get that toy! Such an intent look on Miss Marie-Noire's face. Marie-Noire, you really are the most delectable and delicious of black morsels. You dear little kittyums you!! What a sweet face, bright eyes, and excellent paw-eye-coordination you have, Marie-Noir! Darling! M-N is my fav sister. Squillions of oohs and aaahs are heard 'round the world to celebrate Miss Marie-Noire's fierceness and beauty. Caption: The Force- I has it. May The Floof Be With You !